I never can predict when owning Soay sheep will enrich my life in a new and different way. 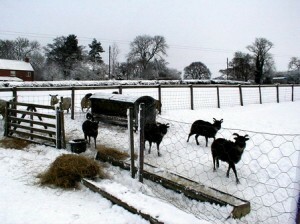 Last Wednesday an e-mail showed up out of the blue that read, in total: “Here is a photo of Yorkshire soay in the snow and being bottle fed.” That’s it, no signature, no mailing address, no explanation of why I was the beneficiary of the photographs, only a return e-mail address and the pictures. Ever wonder what Yorkshire Soay sheep look like in the snow? What a lovely surprise! My father was a large animal veterinarian in Iowa and my family fairly worshipped the most famous veterinarian in the world. We read and re-read his books until they fell apart. Mom cross-stitched the endearing four-line hymn that provided titles for four of Dr. Alf Wight’s [a.k.a. James Herriot] books and the sampler hung over my parents’ living room fireplace for many happy years, a quiet reminder of the centrality of animals to our lives. As you can imagine, I was immediately drawn to this new person in my Soay sheep life. Anne and I continue to exchange notes, and I relish the thought of learning more about her animals and how she tends them. With luck, she will remain agreeable to sharing her Soay lore with you. For example, Anne sent me a dandy picture of her hay feeder, a somewhat different design than we have. I intend to use her photo in a post, already in draft, about hay and hay feeders — nice timing. In exchange, I hope to address her curiosity about how Soay sheep have developed differently over here, a topic on which U.S. Soay sheep breeders can expound for hours and hours and hours, can’t we? 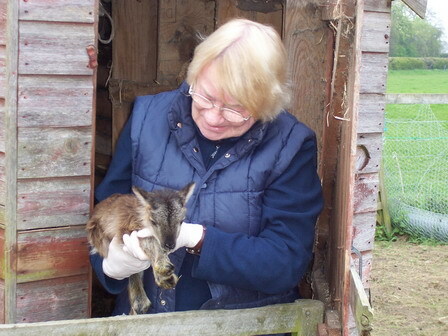 Welcome to The Soay Sheep Chronicles, Anne! Please feel free to participate in this blog with your comments and explore the websites you can find by clicking on the links in the right hand column of this page. I am delighted you found me all the way across The Pond in the American Wild West.